On 23 May 2017, RN’s Books and Arts aired a one-hour broadcast from the Victorian College of the Arts on what it’s like to go to art school, to coincide with this year’s ongoing ART150 celebrations. Guests included: graduates Dannika Horvat, Linton Wilkinson, Nicholas Pearce and Louisa Wall, classical guitar student Louis Virgil Smith, Director of the VCA Professor Su Baker, Head of Music Theatre Margot Fenley, Music Theatre students Sian Crowe, Olivia Morison and Chloe Honig, and VCA Enterprise Professor and internationally-acclaimed visual artist Patricia Piccinini. 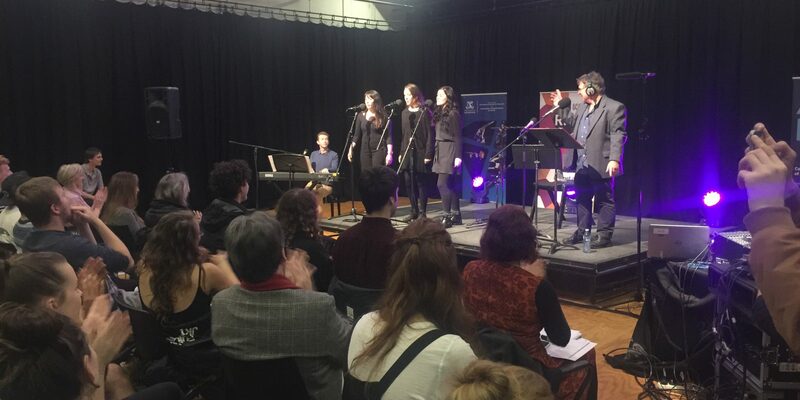 Image: RN Books and Arts presenter Michael Cathcart with, left to right, Sian Crowe, Chloe Honig, Olivia Morison, and Chris Nolan on keys. Picture: Sue Thornton.